DVD 2 of the progressive Flamenco Guitar in 48 lessons for all levels including those who have no notion of the guitar or musical theory yet. The methodology that is being used is the same as used by Jose Manuel Montoya (teacher) in his private classes. The basic techniques that are being studied are applied from the beginning to the most attractive flamenco forms palos; Tangos, Solea, Bulerias and Fandango de Huelva, making the study more enjoyable. The learning methodology is designed to study one lesson per week, and practicing half an hour daily at the beginning of the course and from the third month, one hour a day. 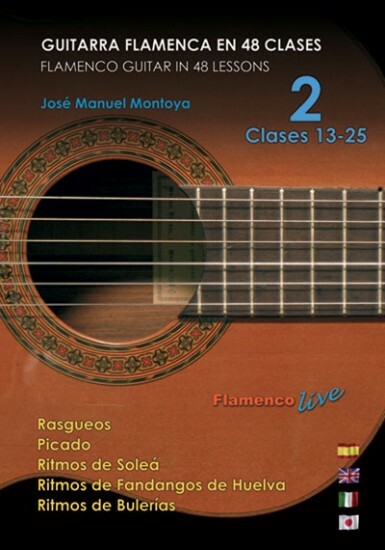 Jose Manuel Montoya, leads to apply this same course for years and it is GUARANTEED that by the end of this course, students will reach the level of Flamenco guitar as shown in the following audios, plus a full mastery of the technique. Lessons 13-25. Explanation of picao technique/ explanations and palmas exercises for the Solea, F, de Huelva, Buleria. Rasgueados for Solea, Bulerias, F, de Huelva/melodic patterns of Tangos, Solea y F, de Huelva (thumb). This DVD offers tracks in four languages: Spanish, English, Italian, and Japanese.